A blog about a bookstore in Milwaukee, Wisconsin. Event Yourself! : Christopher Sturdevant's Wisconsin History, Amitav Ghosh at UWM, Thrills with Mindy Mejia and Kate Moretti, poetry with Austin Smith and Dora Malech, Murder and Mayhem, and Laurie Keller, Alan Silberberg, and Daniel Mason next Monday. Sorry, Dorie Greenspan is sold out. Milwaukee author and Chairman of the Midwest Chapter of the Cold War Museum tells the tales of the Badger State’s role in the showdown between East and West. For decades, Wisconsin’s nuclear missiles pointed to the skies from Waukesha’s back yard, awaiting Soviet bombers. Joseph Stalin's daughter sought refuge in the small town of Richland Center. With violence in Vietnam about to peak, a cargo ship from Kewaunee sparked a new international incident with North Korea. Manitowoc was ground zero for a Sputnik satellite crash, and four ordinary Madison youths landed on the FBI's most wanted list after the Sterling Hall Bombing. Sturdevant recounts the stories of everyday Wisconsinites during the years that the Cold War gripped the world with fear of espionage and nuclear winter in this book, which preserves a fading piece of Wisconsin history. Christopher Sturdevant is Chairman of the Midwest Chapter of the Cold War Museum, a children's librarian in Milwaukee, and a U.S. Air Force veteran. Sturdevant has represented Team USA in master's level track championships on three continents. The Kennan and Vilas Distinguished Lecture series hosts Amitav Ghosh for a talk entitled Embattled Earth, sponsored by Institute of World Affairs, Vilas Trust, Department of English, UWM Letters and Sciences, and Boswell. This lecture explores the continuities between the resource conflicts of the past and the future by focusing on two transformative imperial wars: the Anglo-Dutch spice wars of the 17th century and the 1st Opium War of 1840-42. It also poses a question: are the imperatives of empire and military supremacy among the major drivers of climate change? Amitav Ghosh is a novelist and essayist, author of The Calcutta Chromosome, the Ibis Trilogy, and the essay collection In an Antique Land. He has won the Prix Médicis étranger, an Arthur C. Clarke Award, and in 2017 he was awarded the inaugural Utah Award in the Environmental Humanities from the University of Utah. Boswell offers a preview event for Murder and Mayhem Milwaukee with two critically-acclaimed authors of thrilling new crime novels, Mindy Mejia, author of Everything You Want Me To Be, in conversation with with Kate Moretti, author of While You Were Gone. Mejia’s latest thriller is set in the glacial lakes and untouched forests of the Minnesota Boundary Waters. Ten years ago a man and his son trekked into this wilderness and never returned, presumed dead. Ten years later, the son is discovered ransacking an outfitter store, violent and uncommunicative, refusing to answer questions about his father or the last ten years of his life. As a therapist is drawn closer to this enigmatic young man, she’ll risk everything to reunite him with his father who has disappeared from the known world. Moretti’s latest is a novel that questions the nature of guilt, obsession, and familial ties that follows the daughter of a convicted serial killer who finds herself at the center of a murder investigation. Edie is a recovering alcoholic with a dead-end city job, an unhealthy codependent relationship with her brother, and a growing obsession with the families of her mother’s victims. Mindy Mejia is author of The Dragon Keeper and Everything You Want Me to Be. Kate Moretti is author of Thought I Knew You, Binds That Tie, and While You Were Gone. An evening of poetry from the Princeton University Press Series of Contemporary Poets, featuring University of Wisconsin graduate Smith and Malech, who teaches in The Writing Seminars at Johns Hopkins University. Building on Smith’s reputation as an accessible and inventive poet with deep insights about rural America, Flyover Country draws profound connections between the Midwest and the wider world. Inspired by his childhood on a dairy farm in Illinois, tales of rural life lead the way in this collection focused on family, violence, and memories. Malech’s latest is a collection of serious and playful poems that tap the inventive possibilities of the anagram and other constraining forms, combining lyric invention and wordplay. “Stet,” from the Latin for “let it stand,” is a proofreading term meaning to retain or return to a previous phrasing. Stet is a work of serious play that brings home the connections and intimacies of language. Austin Smith grew up on a family dairy farm in northwestern Illinois. He is author of Almanac, and his work has appeared in The New Yorker, Poetry, and Ploughshares. He teaches at Stanford University. Dora Malech is author of Say So and Shore Ordered Ocean. Her poems have appeared in The New Yorker, Poetry, and Best American Poetry. She is Assistant Professor in The Writing Seminars at Johns Hopkins University. Murder and Mayhem returns to Milwaukee in 2018! This year’s event features a whole day full of the excellent author panels and interviews you’ve come to expect from this mysteriously good event.Enjoy panels, one-on-one interviews, and schmooze with the authors. Find your new favorite writer or hang out with an old favorite. Bring books from home to get signed or buy them from Boswell. News on Lou Berney's November Road - Lawrence Kasdan, whose filmwork includes The Big Chill, The Accidental Tourist, and numerous screenplay credits in the Star Wars franchise, is adapting Berney's latest. Per Deadline: "Kasdan will write and direct, and will produce the film with Shane Salerno's The Story Factory. The producers intend to fast-track the project, and for it to be Kasdan’s next film. Distributors are circling and that part of the deal should be made shortly." Tickets for the whole day cost $40, plus ticketing fees, available at murdermayhemmilwaukee.com. This year, Murder and Mayhem features a criminally good lineup, including special guests Lou Berney, Edgar Award-winning author of The Long and Faraway Gone and Andrew Gross, bestselling collaborator of James Patterson whose latest is a historical thriller set in New York's garment district. The rest of the lineup includes Ed Aymar, Susanna Calkins, Joe Clifford, Angel Colon, Libby Fischer Hellmann, Matthew FitzSimmons, Bryan Gruley, Jennifer Hillier, Chris Holm, Julie Hyzy, Owen Laukkanen, Elizabeth Little, Jess Lourey, Nadine Nettmann, Clare O’Donohue, Milwaukee’s own Nick Petrie, Lori Rader-Day, Tom Schreck,Victoria Thompson, and Fred Van Lente. Alas, Bartolotta's lunch at Lake Park Bistro featuring Dorie Greenspan is sold out. Signed copies of Everyday Dorie can still be requested for pickup after the event. Personalization requries pre-payment. Dorie Greenspan is author of Dorie's Cookies, a 2017 James Beard Award-winner for Best Baking and Dessert book, Around My French Table, named Cookbook of the Year by the IACP, and Baking: From My Home to Yours, a James Beard Award winner. We’re having a potato party and every spud’s invited! It’s an awesome afternoon with author-illustrators Laurie Keller and Alan Silberberg and their perfect pair of potato themed picture books, activities, and yes, potato-based snacks. Please register for this free event at potatomke.bpt.me. A potato and his eggplant nemesis struggle to find the perfect pants in a hilarious, heartwarming tale of forgiveness by author-illustrator Laurie Keller. Potato is excited because Lance Vance’s Fancy Pants store is selling POTATO PANTS! Potato rushes over early, and just as he’s about to walk in, who does he see inside? Mean, pushy eggplant who was rude to him the other day. Can these vegetable rivals make peace in the name of fashion? Alan Silberberg’s Latkes family is just like yours or mine. Except that they’re potato pancakes. And also, they are completely clueless. After they light the menorah and gobble the gelt, Grandpa Latke tells everyone the Hanukkah story, complete with mighty Mega Bees who use a giant dreidel to fight against the evil alien potatoes from Planet Chhh. It’s up to the Latke family dog to set the record straight. But he’ll have to get the rest of the Latkes to listen to him first! Michigan-based Laurie Keller is author-illustrator of books one, two, and three of the Arnie the Doughnut series, Do Unto Otters, and We Are Growing!, the 2017 Theodor Seuss Geisel Winner. Alan Silberbergis an award-winning author, cartoonist, and children’s TV creator who has worked with Nickelodeon and Disney. He’s the author and illustrator of the middle grade novel Milo: Sticky Notes and Brain Freeze, which won the Sid Fleishman Humor Award. While several of us were big fans of Daniel Mason's first book, The Piano Tuner, little did we know that The Winter Soldier would be one of the hot books of fall. Both the publisher and both wholesalers are currently out of stock on this title. While we have enough copies for our event, let us say now that if you miss this event, you're going to regret it later. It's a Monday, so we're pretty sure your evening is free! Part mystery, part war story, part romance, Winter Soldier tells the story of a medical student who enlists when World War I erupts across Europe. In a freezing outpost ravaged by typhus, he finds himself falling in love with the mysterious nurse from whom he must learn a brutal makeshift medicine. From the gilded ballrooms of Imperial Vienna to the frozen forests of the Eastern Front, from hardscrabble operating rooms to battlefields thundering with Cossack cavalry, The Winter Soldier is the story of war and medicine, of family, of finding love in the sweeping tides of history, and finally, of the mistakes we make, and the precious opportunities to atone. Daniel Mason is a physician and also the author of A Far Country. A recipient of a fellowship from the National Endowment of the Arts, he is currently Clinical Assistant Professor of Psychiatry at Stanford University, where he teaches courses in the humanities and medicine. Bookmark our upcoming events page for Boswell's schedule. Boo!swell bestsellers for the week ending October 27, 2018. Honestly, it's not as funny after Halloween. Every so often I book an event and don't quite know how big its going to be. Sometimes I have had big names with a lot of buzz and when the book finally came out, it was quieter. In the case of The Winter Soldier, hype has been building and the book is now out of stock with both the publisher and our major wholesalers. 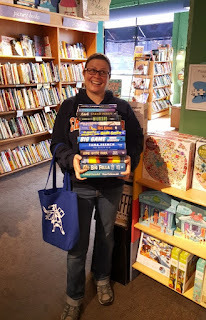 While we have a good amount of books, I wanted lots for stock. It feels like that kind of book. Wouldn't be surprised if it hits the bestseller list in the next few weeks. I'm thinking it's picked up the Gentleman in Moscow crowd. I also know there are a lot of big fans of The Piano Tuner (the second novel, A Far Country), was much quieter. And there's no question that the doctor novel really has resonance - I actually hand sold the book to two people this week buying books for doctor friends who like to read. I'm pretty sure that a number of Milwaukee fans drove west to Madison to see Susan Orlean for her latest, The Library Book. As Jennifer Szalai wrote in The New York Times: "When writing about the books of Susan Orlean, it’s hard not to feel like the neurotic Charlie Kaufman character in the film Adaptation, sweating in front of his typewriter as he tries to work on a screen adaptation of Orlean’s The Orchid Thief. He worries that her book is too sprawling and bountiful to cram into a contrived Hollywood plot, and he ends up just thinking about the banana nut muffin he wants to eat. Orlean’s work in general has that elusive quality to it: exquisitely written, consistently entertaining and irreducible to anything so obvious and pedestrian as a theme." The Journal Sentinel also printed Chris Woodyard's review of The Library Book in the TapBooks page, originally from USA Today. Hey, great to see Ronald H Balson's The Trust hit our bestseller this week. As Balson himself noted, the book is an outlier in the series, a straighforward mystery set in Northern Ireland that is more timely than ever, what with new Irish tensions over Brexit. Balson's latest, The Girl from Berlin, is back to his traditional novels that involve Jewish families unraveling their family histories. Wrote Vicki Gregory in Library Journal: "Balson's many fans will thoroughly enjoy this new addition to the series, which continues the earlier novels' dynamic plotting, compelling characters, and back-and-forth between-eras action. Newcomers will find the portrayal of the plight of the Jews of Central Europe leading up to and during World War II an unvarnished testament to the ugly truth." By now you've figured out that we sold books for UWM Student Involvement when they brought Roxane Gay to the UWM Union on Thursday (assuming you did not already know this because you get our email newsletter or see the signs and print event calendar at Boswell). Even though Hunger is more recent and was closer to the spirit of the essay that students read in conjunction with Gay's visit, it was outsold by her breakout collection Bad Feminist. My favorite moment was when an attendee returned the Gay-edited Best American Short Stories, complaining that this was not Gay's work. It is a mark of her devoted base that a fan might think that Gay wrote all the best short stories in the past year. And I'll bet some of the attendees think she did. We have signed stock of Hunger, but we're out of Bad Feminist. Jonathan Stokes visited schools in the area for his Thrifty Guide to Ancient Greece, the latest book in a popular series that pleases both kids and educators alike. This travel guide to history is for time travelers in the future. While Kirkus dinged the book as too Euro-centric, Booklist is a fan, noting: "Sidebars highlight notable Greeks to lunch with, lost treasures to snag, epithets to avoid (the Great is so passé), and faux Yelp-like profiles of places such as the Oracle of Delphi and the Spartan barracks. Specifically, the book emphasizes the fact that while the ancient Greeks might be long gone, their legacy is enduring." Even though we are not on the University of Wisconsin-Milwaukee campus, Boswell's ties to the school are worth noting. When you count up our work with area colleges and universities, from hosting professors to promoting and even selling at the events of visiting authors, there are close to a dozen schools in Wisconsin in which we have some relationship. But our relationship with UWM is particularly special. For one thing, the main campus begins only about six blocks from our doors. While some schools do not allow us to sell on campus, due to a campus store contract that limits our presence, that's not the case with UWM. 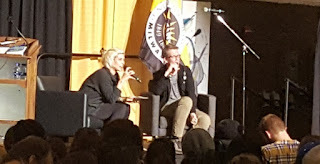 Even when there was campus bookstore, we were given permission to set up campus events, and we have cosponsored a number of events with the UWM Bookstore. And they were fun! And while we cosponsor and sell books on campus with some regularity (five events last week alone), UWM is also represented at Boswell by the faculty and students that appear at the store. This semester has seen more than a half dozen faculty speak at Boswell and more events that were cosponsored by campus groups. The spring will see more, plus readings from UWM creative writing students, both graduates (February) and undergraduates (May). So when UWM asked if we'd sell copies of The University of Wisconsin: The First Sixty Years, 1956-2016 at Boswell, we jumped at the chance. Written by John H. Schroeder, Professor Emeritus of History (and a former Chancellor of UWM), this book is a sequel of sorts to The University of Wisconsin-Milwaukee: A Historical Profile, 1885-1992. Once Professor Schroeder returns to Wisconsin (he's just about to leave for Arizona for the season), we hope to host him at Boswell. 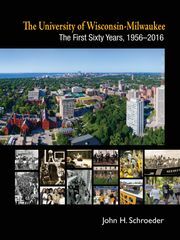 Meanwhile, The University of Wisconsin-Milwaukee: The First Sixty Years, 1956-2016, is available for sale at Boswell and on our website for $24.99. Shipping is $12 by UPS or $6 by USPS Media Mail. From the Boswell email newsletter, our tote feature, bonus sized. You can read the whole email newsletter here. According to Kassia St Clair's The Secret Lives of Color, blue is most people's favorite color. We've seen this play out in our sales of tee shirts and mugs - it is almost always the first color to sell out. And look at book jackets! Many of your favorite books are cloaked in blue, and there are even associations between the particular hue and book genre. Funny books often feature a blue-tinged aqua, while historical novels, particularly ones set during World War II, are often on a field of navy. All your blue books will look smart poking out of our new royal blue tote bag, as seen with Jen (above right). Along with classic black, eye-popping purple, bright red, and Harry W Schwartz green, this tote will tell the world you love books and particularly love books from this particular Milwaukee book store. We've now got a special Boswell Stuff page where you can find our mugs, glasses, tees (adult and toddler), and totes in one place. Blue is also the color of loyalty so it’s used a lot in branding. Think Walmart, Culver’s, etc. This got us thinking about logo colors. CVS and Walgreens both use red, which we think comes from the Red Cross, which we think comes from blood. Green is so closely allied with finance and nature that it's easy for financial firms and outdoor retailers to use it but hard for anyone else. Purple skews young and female (and Daniel), yellow is too hard to read, brown reads muddy (though I love the shade chocolate brown, which was popular in clothing for a hot minute), and orange reads red (and fast food). There are lots of attempts to link color and illness fundraising, but nobody did as good a job as breast cancer charities did with pink. Now it's hard to think about pink in any other way for adults. Our bag manufacturer also had navy fabric, but we thought it read black. But I liked it. Especially for carrying novels about World War II. It's going to take us a long time to work our way through these tote bags but if we did another printing, which color would you want? The additional Envirotote cotton canvas color options are navy, burgundy, kelly green, brown, yellow, pink, gray, and natural. Natural and yellow won't show white ink. The teal, which is actually turqouise (teal is much darker) doesn't come in the 15 oz stiffer cotton, only 10 oz. Oh, and if you wind up making totes from Enviro-totes, please mention we sent you and ask for Sarah. Technology Day! Reviews of "Uberland" and "Lab Rats"
At Book Expo, one of my favorite programs is where we get to listen to editors talk about their books. This year, in the midst of our spring season, I forgot to sign up. I knew from past experiences that a number of people drop out of the program at the last minute. I called Joy at the American Booksellers Association. "Do you want to go to Brooklyn?," she replied. I said sure, expecting to be paired up with Akashic or Melville House, two fine independents that publish books of interest to me. But the next email made it easy - a visit to the Ingram headquarters, not that far from my hotel. Ingram had gathered together several academic publishers, from Princeton, University of California, Brookings (we've done really well with Dream Hoarders: How the American Upper Middle Class Is Leaving Everyone Else in the Dust, Why That Is a Problem, and What to Do about It), Indiana, and Fordham. There was something for everyone - even if your store did not do well with the more serious nonfiction that would be the stock and trade of most of these publishers, Indiana University Press has a very strong food line and a Pence biography. For me, the highlight was a presentation of the book Uberland: How Algorithms Are Rewriting the Rules of Work, by Alex Rosenblat from editor Maura Roessner. Uber has certainly gotten it's share of negative press. But Rosenblat stays away from the controversial missteps of former CEO Travis Kalanick to focus on one issue - what is the role of drivers at Uber? The thesis begins with a perception of the business itself - is Uber a transportation company or a technology company? We know their passengers are customers (with all the manipulation and data mining that goes along with that), but what about their drivers? Are they independent contractors, consumers, or heaven forbid, employees? Uberland argues for each alternative, depending on the situation. Technology ethnographer Rosenblat breaks those arguments down, focusing on bait and switch recruiting, misleading fares, skimmed tips, and algorithm-based processes that take the ‘independent’ out of contractor. And when something goes wrong, drivers are left to automated responses and powerless offshore call centers. That means there’s less about the specific toxic culture of Uber (though she hardly ignores that) and more about problems that are more endemic to all sharing platforms. Based on Uber’s previous run-ins with journalists, Uberland includes a chapter on metholdology, as well as copious notes. It’s what I’d call accessible academic, so expect less storytelling and more thesis support. But if you’re interested, as I am, in what technology is doing to our lives, it’s must reading. One thing that struck me is that Uber gives the bill to the rider right away, but waits ten minutes to notify the driver. According to Rosenblat, this was so rider and driver could not compare notes. Would this lead to the rider and driver getting different information about the cost of the fare? Of course not! And of course, Rosenblat, by focusing on the contractors, gives you the assumption that folks who work in Uber Central have a more traditional career path. Great perks, reasonable hours, room for advancement, no robot bosses. I always think back to that retailer (unnamed) that consistently made the list of Great Places to Work, but their great culture was for folks who worked at the corporate headquarters, not the stores, which were filled with part-time, minimum-wage grunts. Dan Lyons's new book, Lab Rats: How Silicon Valley Made Work Miserable for the Rest of Us indicates that at many tech companies, even folks in the central office are grunts. When Dan Lyons lost his job at Newsweek, he wound up taking a job at Hubspot, only to find that the web 2.0 tech culture was no match for him? He wondered if it was a match for anyone, save tech pro venture capitalists, toxic bosses, and software companies that sold employee monitoring software. But as he began to promote his book on the experience, Disrupted: My Misadventure in the Start-Up Bubble, he found his situation was not so isolated. The business, once the province of nerds and do-gooders, is now run by wealthy money lenders (many of whom are graduates of the PayPal payout) who are intent on building unicorns (privately held startups with valuation over $1 billion), with an end game of pulling out as much money as possible. The lowest priority are workers, who are burned out by overwork and toxic cultures and out-gamed by business strategies such as Agile and Lean Startup (though I should note this obsession with management gurus dramatically predates tech). Some of you might remember the institution of the no-boss philosophy of Zappos – there’s a guru to thank for that. Regarding the horrifying treatment of employees, the thinking seems to be that since they will all be replaced by machines eventually, why invest? Lyons finds some companies that are doing the right thing - hiring employees instead of contractors, focusing on real quality-of-life issues instead of ping pong tables, and one VC (Kapor Capital) that even focuses on gap-closing investment. Just one, mind you. But mostly, Lyons exposes the deeds of unicorns and unicorns in training, including several big names that get mostly white-glove coverage in the general press. Lyons’s reporting is always enjoyable, even when I don’t exactly understand what working with a scrum master is. Let’s hope that Lab Rats inspires less unicorns and more zebras. Get a weekly parking pass at UWM! I'm only sort of kidding.Please note that five of these events are being held at UWM this week. In one case we're the cohost (Nathaniel Philbrick). In other cases, we are either a cosponsor or just selling books at the event. Roxane Gay has an admission charge for the general public - the rest are free but may require registration. In all cases, we'll try to link you to the sponsor's page just in case there are last-minute changes. I'm just doing one big logo here, as there is not room for all the logos with each event listing. Milwaukeean Donald Baumgartner is known as a man who takes a big bite out of life. He’ll chat with his biographer, Kurt Chandler, about his life and times. Baumgartner crossed the Atlantic in a 58-foot yacht through two gale-force storms. He’s set foot on all seven continents and accepted an award from President Ronald Reagan in the White House Rose Garden. He built his family business into a global leader and then made headlines in 2016 when he handed over the ownership of his Milwaukee manufacturing company to his employees. For this event, Baumgartner and Chandler will be joined by Mitch Teich, Executive Producer of Lake Effect on Milwaukee Public Radio. As depicted by author Kurt Chandler, Donald Baumgartner has led a charmed life of adventure, success, and generosity, and he continues to give back to his community as one of his hometown's most charitable patrons of the arts. Impassioned, lionhearted, he works hard and lives large, endowed with an optimistic nature, sense of humor, and a measure of good luck. Donald Baumgartner founded Paper Machinery Corporation in 1951 and now oversees this thriving, international company. He is highly active in Milwaukee-area civic and community organizations including Milwaukee Art Museum, Milwaukee Ballet, Florentine Opera, and Milwaukee Film Festival. Kurt Chandler is a former Editor-in-Chief of Milwaukee Magazine. The author or coauthor of numerous books, his work has also appeared in The New York Times, San Francisco Chronicle, and Salon. Chandler was named Journalist of the Year by the Milwaukee Press Club and was nominated for the Pulitzer Prize. Join UWM Colleges of Letters and Science for the Fall 2018 Dean's Distinguished Lecture in the Natural Sciences with our special guest speaker Dr. John A. Adam. Adam has been Professor of Mathematics at Old Dominion University since 1984. As an undergraduate he was exposed to a concentrated diet of Monty Python's Flying Circus, and he has never fully recovered, even at his advanced age. He is a frequent contributor to Earth Sciences and author of A Mathematical Nature Walk. His talk "Patterns in Nature: A Treasure Trove for the Curious" will address the many fascinating and beautiful patterns in the natural world around us that we often don't even notice. These include rainbows, ice crystal halos, glories, waves on puddles, lakes and oceans (and in the atmosphere), patterns in flora and fauna, and much more. This picture-laden talk will be an introduction to some familiar (and not so familiar) patterns with brief reference to some of the science and mathematics underlying them. More here. 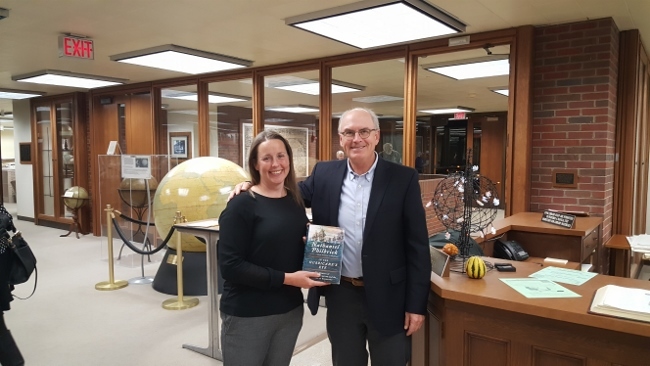 Madison-based critic and essayist O’Gieblyn chats at Boswell with Milwaukee-based author and scholar Jon M. Sweeney about her new collection of essays about faith, culture, and the Midwest. O'Gieblyn's essays have appeared in Harper's, The New Yorker, and Best American Essays. Jon O. Sweeney is an independent scholar who is based in Shorewood whose recent works include editing What I Am Living for: Lessons from the Life and Writings of Thomas Merton and the children's book Margaret's Night in St. Peter. O’Gieblyn, born into an evangelical family, attended the famed Moody Bible Institute in Chicago for a time before she had a crisis of belief, and she still lives in the Midwest, aka Flyover Country. She writes of her existential dizziness, and her rich sense of ambivalence and internal division inform the essays in this collection which ask, what does it mean to be a believing Christian and a Midwesterner in an increasingly secular America where the cultural capital is retreating to both coasts? In Interior States, O'Gieblyn looks at everything from a her personal relationship to Christian rock to Kentucky's creationism museum. Another essay looks at how her family prepared for the end precipitated by Y2K. She also looks at how American Christians map their lives onto the wanderings of the Old Testament Jews and how that translated to a commitment to a non-religious but still charismatic president. Marian Ryan writes: "An Upper Midwest intellectual from a fundamentalist Christian family, O’Gieblyn brings an outsider’s voice to bear on subjects from economic decline and liberal hipsterism to transhumanism and the questionable teleology of motherhood." Read the rest of the Minneapolis Star Tribune review here. The UWM Department of French, Italian and Comparative Literature, MALLT, and the Institute of World Affairs present an evening of bilingual reading, songs with musical accompaniment by Milwaukee's Paul Cebar, and conversation with the socially engaged wordsmith Gaël Faye. Faye's craft depicts the fragility of his Bujumbura childhood haven within the violence of growing national and international tenstions, and calls out exclusionary practices and identity politics, then and now, from Burundi and Rwanda to France and beyond. Gaël Faye's Small Country (Petit pays) has won no less than five French literary prizes, including the Prix Goncourt de lycéens and the Prix Palissy. It was also longlisted for the Andrew Carnegie Medal in the United States. The starred Booklist review exclaimed: "Vividly translated by (Sarah) Ardizzone, this powerful tale, a best-seller overseas, presents a world where there are no easy demarcations of good and evil, sane and insane, or pure and corrupted, as Faye focuses not on offering judgement but rather on capturing the full impact of social and political disintegration." More here. Philbrick, the National Book Award winning author of In the Heart of the Sea, chronicles the thrilling story of the fateful year that won the Revolutionary War during a special evening in the perfect setting for historic adventure. Please register for this event or upgrade to a book-with-ticket option, which includes a copy of In the Hurricane’s Eye, all taxes and fees, and signing line priority, at philbrickmke.bpt.me. From Mark Katkov at NPR Books: "Nathaniel Philbrick's masterful new look at the American Revolutionary War's end days isn't quite revisionist history, but it comes close. With both hands, he grabs the reader's head and turns it towards the sea. Naval power, according to the account in his new book In the Hurricane's Eye: The Genius of George Washington and the Victory at Yorktown, was central to the victory at Yorktown - but is largely overlooked because the decisive sea battle that preceded it did not involve Americans." National Book Award winner Nathaniel Philbrick is the author of Mayflower, a finalist for the Pulitzer Prize, Valiant Ambition, winner of the George Washington Prize, and Bunker Hill, winner of the New England Book Award, among other books. We can't think of a better place to see Nathaniel Philbrick than at the American Geographical Society Library at UWM's Golda Meir Library. Cohosted by UWM Libraries. Come join us! UWM Peck School of the Arts Artist’s Now! guest lecture series, cosponsored by AIGA Wisconsin and Boswell, presents a rare opportunity to hear from graphic artist Emory Douglas, former Minister of Culture of the Black Panther Party. This event is free and open to the public, but registration is required and space is limited. Register at emory-douglas.eventbrite.com. Black Panther: The Revolutionary Art of Emory Douglas is the reformatted publication of the first book to collect the provocative posters and groundbreaking graphics of the Black Panther Party. The Black Panther Party for Self Defense, formed in the aftermath of the assassination of Malcolm X in 1965, sounded a defiant cry for an end to the institutionalized subjugation of African Americans. The Black Panther newspaper was founded to articulate the party’s message, and artist Emory Douglas became the paper’s art director. Emory Douglas is a graphic artist who was Minister of Culture for the Black Panther Party from 1967 until its discontinuation in the early 1980s. His artwork was featured in most issues of The Black Panther newspaper. Douglas’s artistic talents and experience proved a powerful combination: his striking collages of photographs and his own drawings combined to create some of the era’s most iconic images. More info here. UWM’s Distinguished Lecture Series presents the award-winning author of Bad Feminist, Difficult Women, and An Untamed State. Gay also recently became the first black woman to write for Marvel with World of Wakanda, a comic series set in the Black Panther universe. Tickets are available to the general public for $10 in advance, at uwm-roxanegay.eventbrite.com, and will be available for $12 at the door. Tickets are free for UWM students, $5 for non-UWM students in advance, $8 for non-UWM students at the door, and are available at the UWM Student Union Information Desk. Courageous, humorous, and smart are just a few words used to describe the internationally acclaimed author and cultural critic. She works to critique modern culture through her humor and enthusiastic personality. NPR named Bad Feminist of its best books of the year. Gay is also an opinion writer for The New York Times and a founding editor of PANK literary magazine. Roxane Gay is author of Bad Feminist, a New York Times bestseller, the novel An Untamed State, a finalist for the Dayton Peace Prize, and the story collection Ayiti. She has also written for Time, The Rumpus, and Salon, where she was a featured columnist, and her fiction has been selected for Best American Short Stories 2012 and Best American Mystery Stories 2014. More info here. More info on upcoming events here. Boswell bestsellers for the week ending October 20, 2018. A whole bunch of signed copies available means we've passed the figurative hump day of the fall event season, but there's plenty more to come. Excited to have read six of the top ten this week and I'll be at seven as soon as I finish The Winter Soldier, which Anthony Doerr called "a dream of a novel." Lou Fancher in the (San Jose) Mercury News writes: "As in the Palo-Alto-based writer's previous novels (The Piano Tuner), a central character ventures to locations not found on maps and returns altered, unable to be the person each was before circumstances and experiences caused inner, outer and often calamitous change." Mason is in the Psychiatry department at Stanford. This third novel took 14 years to write. See you at Boswell on November 5. While we have 100 people registered for Nathaniel Philbrick's talk at the American Geographical Society Library on Wed Oct 24, 6:30, we should have 200 (capacity). This is a rare treat. I know you love history talks. I know you will love the special setting that is UWM's map library. Dylan Thuras has been featuring the space in his Atlas Obscura program as one of the special places to not miss here. Mark Katkov at NPR writes: "Naval power, according to the account in his new book In the Hurricane's Eye: The Genius of George Washington and the Victory at Yorktown, was central to the victory at Yorktown - but is largely overlooked because the decisive sea battle that preceded it did not involve Americans. It's a startling take on a familiar history that one might expect from this author." Register here! If you're wondering about why Dawn Tripp's Georgia is at the top of this week's chart, it was part of an unusual event. The Sharon Lynn Wilson Center brought in a Georgia O'Keeffe living history interpreter Leslie Goddard for their annual Literary Lunch. While the program was not based specifically on Dawn Tripp's novel, we saw last year that biographical novels are a great way to read a little more about the subject, with the caveat that it's a novel. I can't help but count these sorts of things - I read eight of our top ten bestsellers in this category. On first count, I was at 121 books read in 1,000 Books to Read Before You Die (signed copies available), but then the author explained that the sidebars were included and I jumped to at least 122. My goal is to read one more before the end of the year. I can't choose Mustich's pick for Isabel Allende because it's The House of the Spirits which I did read. But I can still put In the Midst of Winter, the story of a university professor who meets a young undocumented Guatemalan needing help during a snowstorm. Here's my take on Interior States: "Whether she is pondering our vision of hell, contemplating the state of CCM (Contemporary Christian Music) or visiting the Creation Museum in Kentucky, essayist Meghan O’Gieblyn has a unique perspective in the literary world – that of a woman raised Fundamentalist, home-schooled until tenth grade, and then a few years at the Moody Bible Institute in Chicago. Her essays sort of explain everything – if we’re heading towards annihilation and not utopia (an important part of the schism that arose in the 1920s from mainstream Protestantism), why preserve the earth? If it’s important to save as many souls as possible, why not stop mentioning Hell, as has been the case in consumer-driven churching? Alcoholics Anonymous, Greenfield Village, the Pure Michigan advertising campaign, The Singularity, Madison – just about any subject is more interesting with her at once sympathetic and skeptical perceptions. A fascinating, adroitly written collection!" Our event is Tuesday, October 23, 7 pm, at Boswell, with O'Gieblyn in conversation with Jon Sweeney. Just announced! Rosemary Wells at the Milwaukee Public Library Central Library Betty Brinn Children's Room on Thursday, November 8, 6:30 pm. A new exhibit featuring images from the book Hand in Hand. Central Library isn't normally open on Thursday evenings so this is a special treat. Boswell will be there selling books that Wells will sign, including Sleep, My Bunny, which doesn't officially release until November 13. Over at the Journal Sentinel, Carole E Barrowman offers her quarterly take on mystery picks.This month's theme is "If you like that, try this!" --If you enjoy the ironic wit and criminal adventures of Lawrence Block’s Bernie Rhodenbarr, then you’ll want to read Timothy Hallinan’s Nighttown...(Junior) Bender is hired to burgle an old Los Angeles mansion that 'hummed with malice' and smelled of 'baby powder.' The mysterious woman in a bad wig who hires him says, “I’ve even got a key. I mean what could go wrong?” How about everything? --"If you love the ingenious points of view and the unusual plotting of Kate Atkinson’s novels, you’ll devour Tana French’s The Witch Elm ...French’s descriptions of Toby’s internal world post brain trauma are stunning and nerve-wracking and they drive the narrative forward with a claustrophobic intensity." Note that the latest French is a stand-alone, not connected to the Murder Squad series. --If Dennis Lehane’s novels leave a profound mark on your psyche, then Lou Berney’s November Road will rock you back on your heels in awe to 1963. Set against the backdrop of Kennedy’s assassination and an America looking seriously at itself for the first time, Frank Guidry is a Goodfella, a fixer, married to the mob, and “too old to learn new tricks” because the “old ones still work just fine.” Until they don’t. --Finally, if you connect with the high-tech plots and cool characters of P.J. Tracy’s Minnesota-based Monkeewrench novels then Chicago-based Julie Hyzy’s Virtual Sabotage is worth your real time. You can read more about each of the recommendations here. Here's a reminder that Lou Berney, Julie Hyzy and many other authors are attending Murder and Mayhem on November 3. If you love mysteries, this is a one-day con that will thrill you. Also in the Journal Sentinel, Anika Reed offers highlights from Ellie Kemper's My Squirrel Days. Did you know Unbreakable Kimmy Schmidt had a working title of Tooken?